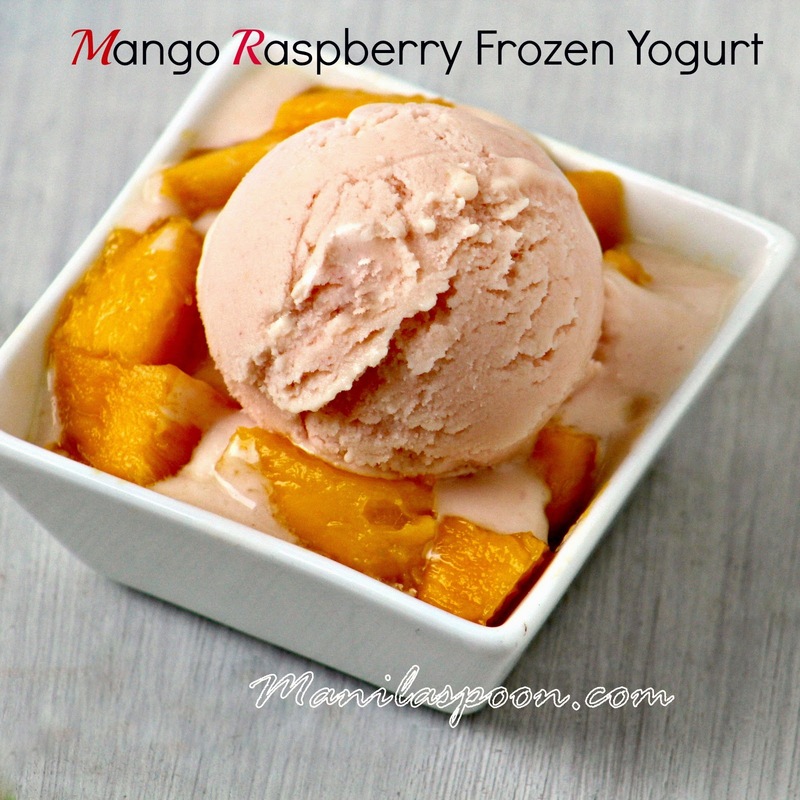 No need for an ice cream maker to make this easy, refreshing and scrumptious Mango Raspberry frozen yogurt! 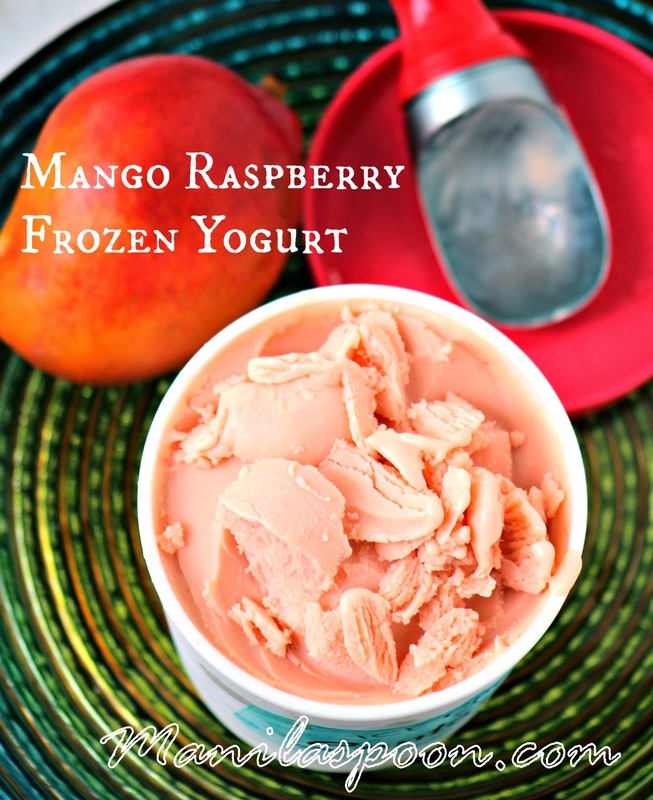 Sweet mangoes and tangy raspberries will keep you deliciously cool this summer! My family loves frozen yogurt. When we still lived in Holland, MI we would often visit the local store that sells frozen yogurt (fro-yo, as its known) and have that as a dessert. I find, however, that store-bought ones can still be loaded with so much sugar and so may not necessarily be a healthier alternative to ice cream after all. I thought it would probably best to make one at home so you can certainly control the sugar content without sacrificing taste and ensure that it’s a truly wholesome dessert. *Either use a pre-strained yogurt (like Fage) so there’s no extra water or strain it first before you use it. *1 1/2 cups will give a subtle mango-raspberry flavor so feel free to increase to up to 2 cups if you wish to make it more intense. Use ripe and sweet mangoes, if possible. Whisk the yogurt with the sugar, salt, vanilla and honey or agave nectar in a bowl. Cover and place in the fridge while preparing the fruits. 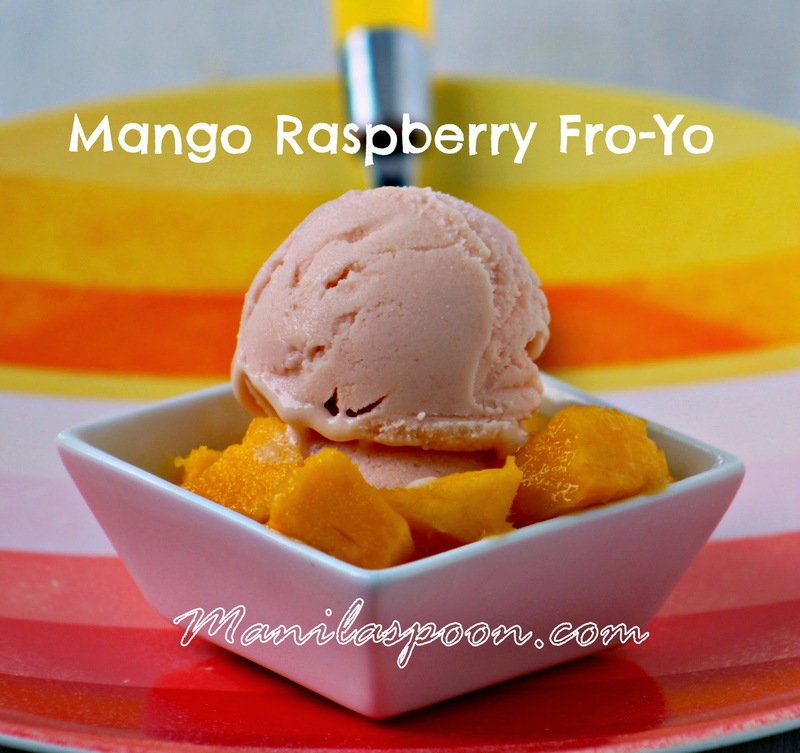 In a food processor or blender, puree the mango and raspberries (together or separately). Strain to separate the seeds and fiber from the fruits. The puree should amount to at least 1 1/2 cups (up to 2 cups). Stir in the honey and lemon juice. Adjust to taste. Mix with the yogurt mixture in the fridge. Pour the mixture into the ice cream maker and process according to the manufacturer’s instructions. You can enjoy your frozen yogurt right away. But should you want to freeze it longer, just let the yogurt soften a little before serving. To make this without an ice cream maker, just place the yogurt mixture in a freezer-safe container. Cover and freeze immediately. After 30-40 minutes take out of the freezer then whisk to break up the ice crystals. Freeze again for another 40 minutes. Repeat the process one more time and then freeze finally for another 1-2 hours or until firm to your liking. Serve thereafter. 🙂 Enjoy! If you like what you see and would like to receive new recipe updates, we’d love you to subscribe to our posts via email or join our site. Needless to say, we’d love you to like us on Facebook or follow us on Pinterest and Google+ so you can see more recipes and updates from us. Thanks and happy browsing! Oh my what a treat! Love this recipe and can't wait to give it a try! this time of year, my ice cream maker is busy! I think this needs to go on the list, the flavors are GOOD! Raspberry and Mango sounds perfect together. I haven't tried making my own frozen yogurt but I think I should. My kids would eat this up so fast! perfect for this time of year! Looks amazing!! Looks awesome for a super hot day! Love me some fruity desserts. We all love fro-yo too! 😉 I love mango & raspberry, never thought of combining them. Perfect! For the purée of mango and raspberry. I’m from Australia. Would that be like 1 mango and 1 punnet of raspberries and blend together or frozen mango and raspberry??? Please help with ratio. I wouldn’t mind trying this recipe. Would it still work with normal Greek yoghurt not low fat?? That sounds good. You can measure it to taste which I do. Any yogurt would do.